I was looking around in a distant galaxy and ran into what is probably the biggest object labelled a selena in SE. Other than being curious as to whether this kind of giant selena was intended (they're not common though) and how the program determines whether an earth sized body becomes a selena or not, I'm wondering whether this got mis-classified, somehow. Also, it looks like the procedural engine didn't take into account for the larger size since I didn't see any really big craters or anything. Edit: Here's the location if anybody wants to check it out. I remember running into a 9 Earth mass selena in 0.95 It looked quite like this one, densely covered in craters. It was actually in orbit around a gas giant at near-brown dwarf masses, which was orbiting an O4 star, so everything in that system was huge. Dude, good find. Perhaps the planet was the product of a massive collision with another in the ancient past, adding to its mass, stripping most of its atmosphere, and giving it those moons and baby rings? But then the collision and their natural bulk would produce a lot of volcanic activity that would erase all those craters. And at nearly six billion years old, such activity would still be going strong. Any other ideas how a Selena can be so huge? I did initially think that it had a large iron core, but then again, at this size, the core shouldn't have cooled off that fast unless something happened to it at some point. Still, it is missing the volcanism, and if it were very dry, the plate tectonics might not be there, or at least really slow. For the baby ring, I figured a smaller and closer in moon got too close and disintegrated. But yea, it just seems out of place with its terran size and mass, like theres some features and/or elements missing. Which is what led me to wonder how SE dertermines what becomes a Selena. This one seems like it would be on the edge of being generated as a desert rather than a selena. 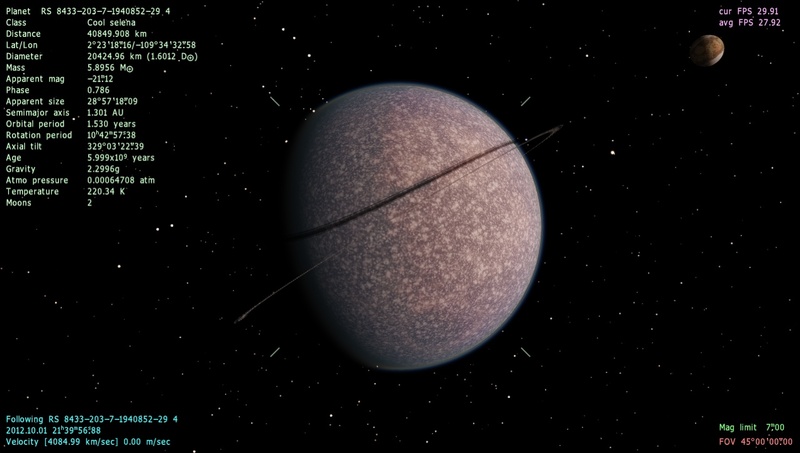 SE classify any rocky body without or almost without atmosphere as Selena. Selena is a class of planets/moons that have regolith instead of dust on its surface and, rayed craters are save their rays for millions of years. This is possible due to absence of atmosphere. In this planetary system even very massive bodies lose atmospheres due to powerful ultraviolet radiation and solar wind from hot O4 star. It doesn't neccesarily take an O4 class star to do that, anything without a magnetic field is going to be at risk of getting the atmosphere slowly stripped away over time. See Mars for an example. Also, this particular systems sun is one that is slightly bigger, slightly less massive and somehat cooler and dimmer than our sun. Even without a magnetic field though a planet 5-10 Earth masses should almost always have and atmospheric pressure between 10 and 100 times greater than Earth's due to there high amount of gravity and mass and this also assumes they didn't become a gas dwarf which is more likely at those masses. Mars is a small body, intermediate between desert/terra and selena, it has low gravity, so lost its atmosphere and water billions of years ago. The magnetic field is not so important for this: look at Venus, it has no magnetic field too, but has anextremely dense atmosphere.